JACKSONVILLE, FL., October 16, 2018 – Since first opening its doors in April of 2015, the goal of the Proton Therapy Center at Ackerman Cancer Center was to provide patients access to the best radiation therapy possible. Just a few short years later, the center has done just that with the start of the their 1,000th patient. 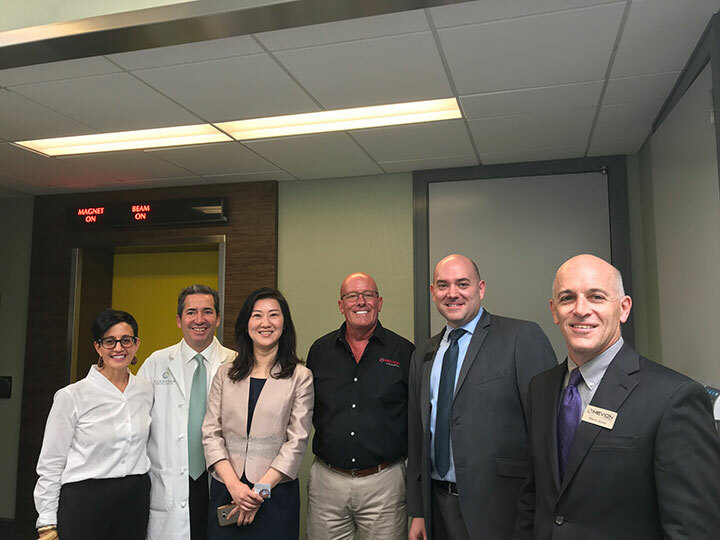 Pictured left to right: Mrs. Alexandria Ackerman, Dr. Scot Ackerman, Ms. Tina Yu, Mr. John Ostler, Mr. Yoel Bakas, and Mr. Mark Jones at thr 1,000th Patient Treatment Celebration at Ackerman Cancer Center. Ackerman Cancer Center’s mission is to be the first resource where patients turn when diagnosed with any type of cancer. Ackerman Cancer Center provides the most advanced radiation oncology treatment available, in a compassionate and respectful environment. A highly trained staff of radiation oncologists and medical professionals provide convenient access of care at three locations across Northeast Florida. Learn more at www.ackermancancercenter.com.